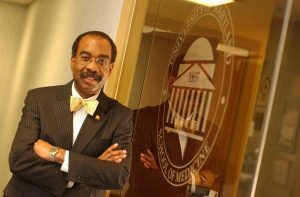 When Dr. E. Albert Reece reviews how the University of Maryland School of Medicine is fulfilling its mission, he looks externally, to the people the school serves. Reece, who is leading a $1 billion business with a faculty and staff of more than 8,000 people, says he has worked to raise the school’s profile so it can make an impact on health around the world. In 2016, he invited teams of top scientists to come to the school to help find treatments for the world’s most complex diseases. The program helped conduct clinical trials for a Zika vaccine developed by the National Institutes of Health and also led to advancements in HIV vaccine research and the development of the only U.S. vaccine to prevent cholera. Reece has also worked on behalf of cancer patients, and as a result, the University of Maryland Marlene and Stewart Greenebaum Comprehensive Cancer Center earned the highest level of distinction in 2016 when it was designated a comprehensive cancer center by the National Cancer Institute. “Over the past 10 years, I have worked extensively to encourage and accelerate biomedical research, innovation, and discovery, and have been a leader in incorporating research and critical thinking into the medical education curriculum,” Reece says.